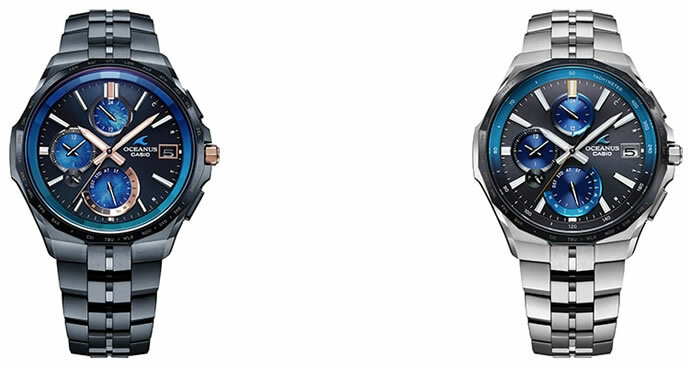 At Baselworld 2019, Casio is showcasing many new products that demonstrate every kind of evolution—in material, in construction, in function. 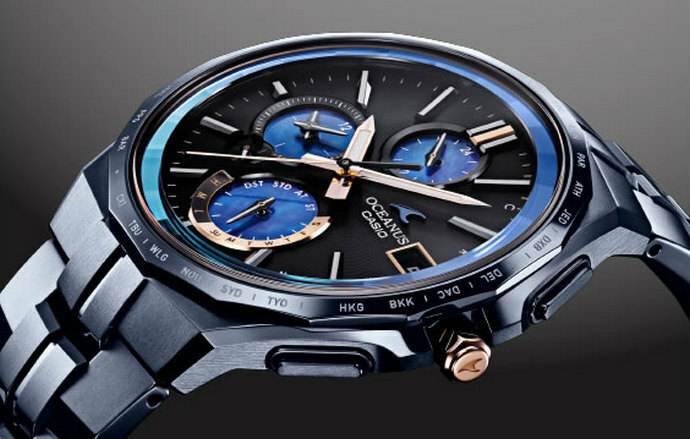 Besides ground-breaking new G-SHOCK watches employing all-new materials, Casio announced it’s thinnest-ever OCEANUS models featuring new constructions. The new OCEANUS Manta is the thinnest-ever OCEANUS and features an aesthetically delightful, sophisticated profile. Two models will be released, the limited edition OCW-S5000S, with just 200 watches to be sold worldwide, and the S5000E. The limited edition 15th Anniversary Model OCEANUS OCW-S5000S boasts inset dials crafted of mother-of-pearl, finished in blue while still preserving its natural texture. It also employs a sapphire crystal outer ring on the dial, cut to show 24 facets and treated with a vapor deposition finish in a gradation from blue to light blue. The dial also has a vapor deposition finish that enhances both color and texture, elegantly presenting the blue brand color. 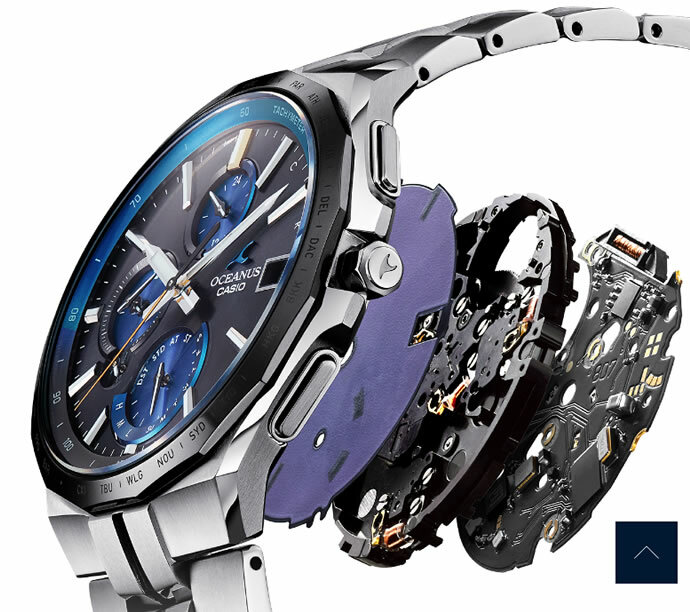 The titanium case and band feature a new Blue-AIP (Arc Ion Plating) treatment that offers enhanced wear resistance. The OCW-S5000E features a deep black bezel treated with a diamond-like carbon (DLC) finish that increases hardness. The inset dials have a vapor deposition finish in the blue brand color. The outer ring on each inset dial is finished in a brilliant new color using sputtering technology to accentuate the sophisticated look of the watch. The new models receive radio wave time-calibration signals, and they also connect to a smartphone via Bluetooth, to ensure accurate time. When paired with a smartphone, the user can easily and intuitively set the world time to any of over 300 cities. The watches also automatically switch between time zones and adjust for daylight savings time. 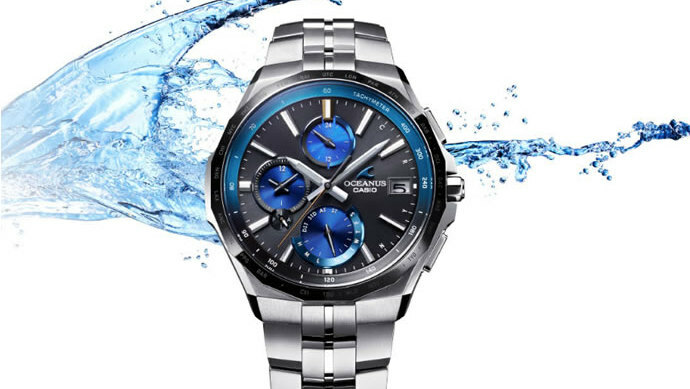 Both the OCW-S5000S and OCW-S5000E are thinner than any previous OCEANUS watches. Casio achieved the slim design by reducing the thickness and size of the components, shaving size in increments as small as 1/100th of a millimeter, and by using high-density mounting to place all the components on one side of the circuit board rather than on both sides as in previous models. The result is a thin profile just 9.4 mm deep, 2.3 mm thinner than the existing model.